Italy-based Sacmi said that that a global food and drink company has invested in its inspection systems to meet quality control needs for its US plants. The inspection systems will be deployed by the unnamed firm to correct cap application on its dairy and ready-to-drink products manufactured at its American facilities. One of the systems chosen by the food and drink company is the CVS360-3D inspection system developed by the Automation & Service Division of Sacmi. According to Sacmi, CVS360-3D addresses a common bottling line issue relating to the necessity to monitor the application angle of the cap on all the single containers. Besides, containers with caps that are too light or too loose have to be rejected, a challenge that is claimed to be met by using CVS360-3D. Sacmi says that the CVS360-3D mounted on the LVS360 platform was observed by the customer who undertook out in-the-field trials and dynamic tests in the Beverage R&D facility of Sacmi Imola. The result has been claimed to be complete guarantee on output quality with false rejects brought down to less than 0.03%. Sacmi stated that the LVS360 system equipped with the CVS360-3D module has the ability to check for correct cap application. Particularly, by using 4 HD video cameras it can measure the actual distance between the logo on the bottle support ring and the embossed logo on the bottle cap. 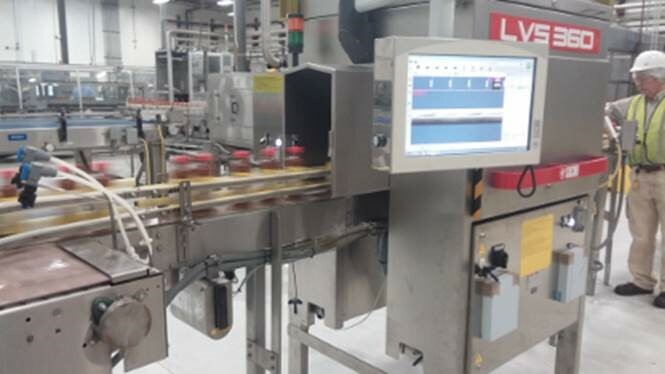 The LVS360 system has been designed to be used to help production of food and drink products with an hourly inspection capacity of 72,000 bottles. It can cover neck diameters of up to 38mm as per Sacmi. Image: Sacmi’s CVS360-3D module on the LVS360 platform. Photo: courtesy of Sacmi.